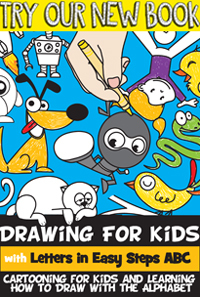 Presidents Day is coming up on February 15th this year (2010) and I am posting a great project for teachers to do with their classrooms full of students. This is a great group project to celebrate George Washington’s birthday. This project includes paper folding and cutting and the use of clay. See below for the instructions to make George Washington’s camp. Use this to teach the kids about the Revolutionary War and General George Washington who later became America’s first president. (2) Fold diagonals of the corner squares. (3) Cut on these diagonal lines. (4) Now cut on the solid lines. (5) Paste square A to square B. 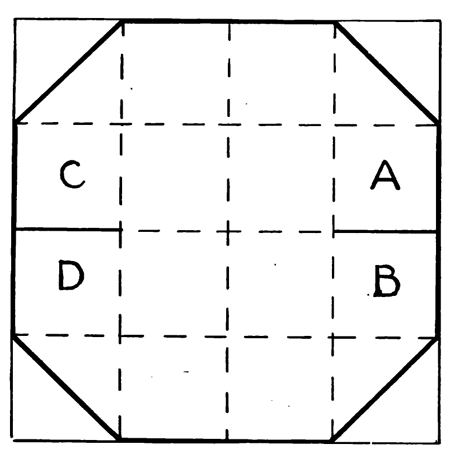 (6) Paste square C to square D.
(7) A slit may be cut in one end and the edges folded out to represent the opening of the tent. 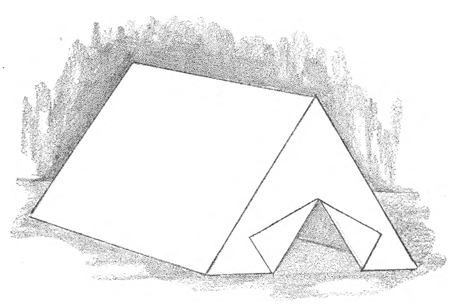 Fold several tents …at least 5 of 6. (1) Make the cannon by forming 2 thin circular pieces of clay. (2) Join these 2 circular pieces of clay with a toothpick. 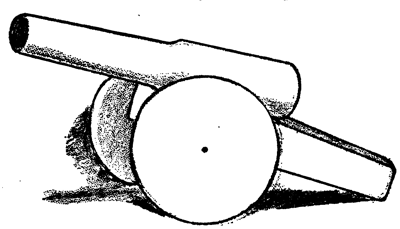 (3) Make the cannon’s stock with clay and place it between the 2 wheels that you just made. (4) Make cannon with clay and place on top of the stock that you formed in step #3. Below is the paper folding instructions to make the drum. (2) Make a crease that is about 1/2 inch from the bottom (as seen above). (3) Make vertical cuts (up and down) from edge to edge along this crease (see the image above). (4) Paste ends together so that it forms a cylinder-like shape. 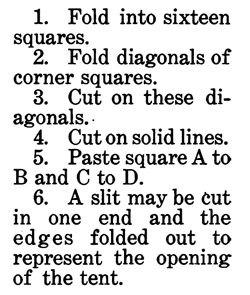 (5) Remember when you made all of those cuts along the bottom of this paper…now fold them in. (6) Cut a circle that fits the cylinder shape that you just made. (7) Paste this circle onto the slits of paper you just cut and folded in. 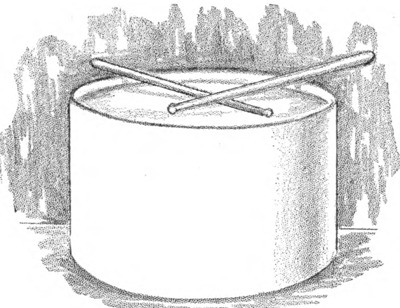 To Make the Drum Sticks, you can either use toothpicks or make them from clay. 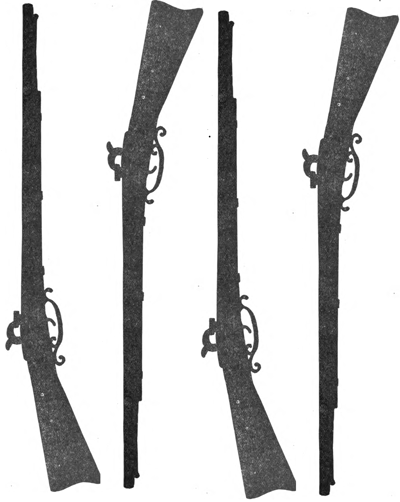 Print out these military rifles by (1) right clicking on them to open them in a new window (2) Click on File > Print. Print out this Colonial US Flag by (1) right clicking on them to open them in a new window (2) Click on File > Print. Find a chopstick, a stick from outside or other sturdy stick-like object. Fold this Colonial US flag in half and past it around the stick. 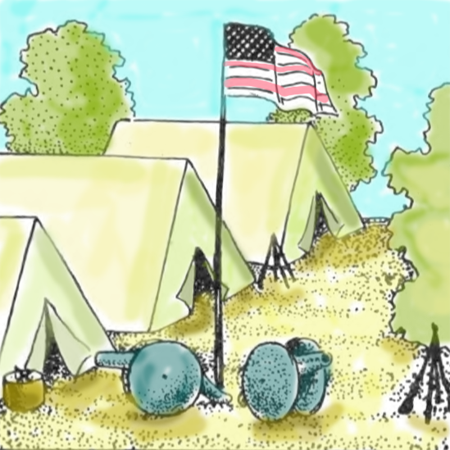 Now let the groups of children place their tents and cannons on to the poster board (or cardboard) to represent George Washington’s camp. Attach the flag to the cardboard or poster board by punching it through the board and then placing the Cannons Around it. You can also cut out trees and place them around the camp and if you want, you can place rifles in formation (as seen in the picture above). Good luck and Happy Presidents Day. oh cool…got to see this..everyday..
fantastic! i like so much.